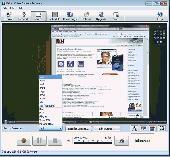 You can play multimedia files (WMA,WMV,MP3,MP4,WAV,MID,MPG,AVI,FLV) using Accessory Media Editor. Select multiple files to play, or one file. Music or Videos playing, can be saved as Favorites. A history log is kept for all files played. M4VGear DRM Media Converter can easily remove DRM protection from both purchased and rented iTunes videos while keeping 5.1 audio on Mac and convert M4V to unprotected video & audio formats with 20X faster speed and lossless quality.